The terms hydrophobic and hydrophilic may not mean anything to the average person. But, to a contractor, these terms can mean a world of a difference. Hydro means water while phobic means “to fear” and philic means “to love”. Alchemy-Spetec offers both hydrophobic and hydrophilic polyurethanes, so it is important to be aware of the differences between the two types. Hydrophobic polyurethanes naturally repel water (similar to the way oil would repel water and stay separate if you were try to mix them in a glass). These products push water out of the area in question as they expand. Hydrophobics are used with catalysts which allow you to adjust the set time. They also have zero shrinkage after curing. 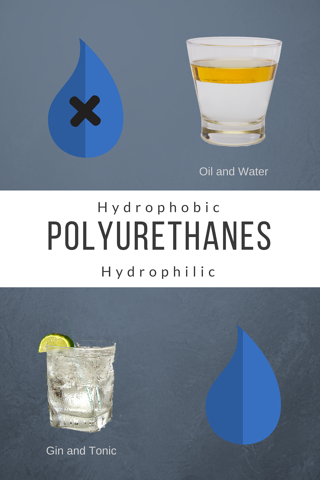 Hydrophilic polyurethanes naturally mix with water before curing (similar to the way gin and tonic mix thoroughly in a glass). This characteristic allows for a very strong chemical and mechanical bond, as water helps pull the material into the pores of the concrete. These products do not require a catalyst. You can pump them straight out of the pail. Don't get caught in the trap of oversimplifying hydrophilic vs. hydrophobic. There are varying degrees of each (see chart below for more information on how this is measured) . Some hydrophilic materials will keep absorbing water (10-15 times their original volume). Others (such as our AP Seal 500) only absorb as much water as is necessary for their reaction and then they reject the rest. Yes, hydrophilic gels will shrink like crazy in the absence of water, but the AP Seal 500 won't. It is completely safe to use in a dry environment.